Steve Forbes, publisher of Forbes Magazine, was a strong defender of the US patent system. 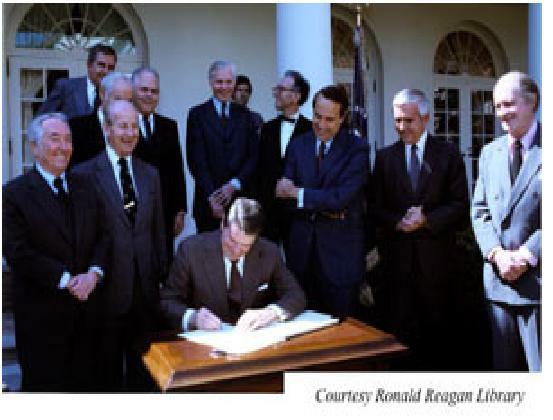 He followed in the footsteps of one of his hero’s, Ronald Reagan, who made strengthening the US patent system a major part of his economic reform. For more information see Reagan’s 100th Birthday. Now Forbes (the magazine) pushes an anti-intellectual, anti-free market, anti-patent point of view as evidenced in the opinion piece Google’s Conundrum: Buy The Patents Or Pay The Lawyers? The author belongs to that Luddite group that wants to categorize patents as monopolies. Patents are property rights. Property rights derive from the act of creation or more specifically invention in the case of patents. Monopolies are the result of political calculations and have nothing to do with creation. When Prime Minister Tony Blair and President Clinton suggested imposing restrictions on patents in the field of genetics, publicly traded bio-tech firms experienced a predictable mini-crash. The impact of their recommendation would not have been as violent if the patents had shorter lives than twenty years. Of course if the property rights in one’s invention was weaker before you suggested making it even weaker, it would have less impact on the value of the companies owning these assets. This is like saying the value of a company will decrease less when nationalization is proposed if the tax rate were higher. For instance, if the tax rate were 100% then it would not affect the value of company at all if politicians proposed nationalizing the company. The author Reuven Brenner, is an economics professor at McGill University according to Wikipedia. You would think that a professor would not make these obvious logical errors – the sort of errors that would make even an undergraduate paper on the topic receive a C or lower. What would happen if the life of patents was shortened? Yes and the price of all goods would decline if we would just get rid of property rights. Of course, no one would produce anything and the same is true of weakening patents. Innovation will come to a virtual standstill. History shows that without secure property rights in inventions, innovation grows so slow that humans are stuck in the Malthusian Trap. See The Source of Economic Growth. As for there being less piracy that is like saying there would be less car theft if we did not give people title to their cars. This is not Alice in Wonderland Mr. Brenner. Words have meaning and even if there is not a law against piracy, it is still piracy. Mr. Brenner continues with his Socialist line of reasoning by arguing, “Phillips’ initial success in Holland and throughout Western Europe was due to copying Edison’s lamps without paying any royalties to the Edison interests.” Stealing always enriches the thief, but it does not create wealth it redistributes it and destroys it. How many invention was Edison or some other inventor unable to fund because Phillips stole Edison’s inventions? Mr. Brenner should be aware that since Robert Solow’s famous paper on economic growth it is clear that all per capita growth is due to increases in technology. Most new technologies are created by start-ups that require property rights in their inventions (patents) in order to secure capital. (See SBA Study). In addition, all net new jobs in the US are created by start-ups according to the Kauffman Foundation. If the US wants to create high quality, high paying jobs it needs strong property rights for inventions. 1. What would happen if the life of patents was shortened? 2. What would happen if the life of patents was lengthened? 3. What would happen if economists admitted that economics does not even rise to the level of a dismal voodoo let alone to one of a dismal science? In a true science, one could test most hypotheses and falsify them by such testing. However, in the voodoo realm of economics, one can get away with being completely ignorant and proud of it too. The fact is the test of “what would happen” for above points 1) and 2) gets carried out every year, every week. If the maintenance fee of a patent is not timely paid, it’s life IS shortened. If the PTO screws up in meeting statutory deadlines of the American Inventor Protection Act, the life of the patent IS lengthened (extended). Vast stretches of technological prairie land are not “unstifled” when patents die before full term for failure to pay maintenance fees. The sky does not shatter and come crashing down in shards when patent terms are extended.